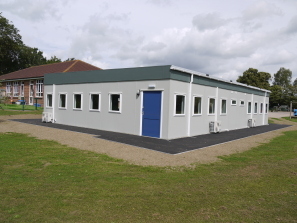 Located in Ryarsh, Kent and commissioned by the Local Authority, this purpose built, 5 bay Modular Building now provides a modern, safe and much needed additional "double classroom block" to the school. This prefabricated Building provides a total floor area of 168 sq. m and incorporates 2 No. classroom areas each providing 60 sq. m of teaching space. A fully equipped DDA compliant disabled toilet, 2 No. children's toilets, stationery stores and entrance lobby with automatic opening double glazed aluminium entrance door are also provided. A hot/cold air conditioning system keeps the fully carpeted classrooms at a constant temperature and a suspended ceiling system with recessed light fittings is provided throughout. Externally, the walls of this Modular Classroom Building are finished in low-maintenance plastisol steel whilst the roof is constructed with a mono pitched flat roofing system and hard wearing "Hypalon" blanket. This Modular Building was supplied and installed during the Summer Break to minimise disruption to the school calendar and the Health and Safety risks to both children and staff. An excellent light and airy environment to enable the children to take their first steps in the learning process! Need a lesson on how to create more space? Need more space for your leisure/sports facility? Need more space for your business to expand?